It wasn’t enough for Mr. Eddie Huang to simply host a new food-reality TV series on MTV. 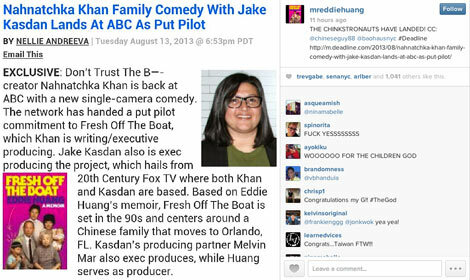 Now, the Baohaus chefs’ memoir, Fresh Off The Boat, is being made into a put pilot for ABC by Don’t Trust The B—- in Apartment 23 creator Nahnatchka Khan. Khan is writing/executive producing the pilot and Huang will serve as producer. The show is set in the ’90s and revolves around a Chinese family that moves to Orlando. (Although, Huang’s real-life family is Taiwanese.) “This is a setup Khan can relate to as she too is a first-generation American whose parents were ‘fresh off the boat,'” reports Deadline Hollywood. We can only hope the network’s put pilot commitment translates into a full TV series, if only to see who gets cast as lil’ Eddie.